Please select your options above. Prior to shipping your order, one of our representatives will contact you to verify your Frequency & Band details. All options will show available but please allow 2 week delivery frame for most configurations, Feel free to call if you have any questions - 310-416-1200. Thanks for shopping with us! Microwave radio always played a key role in mobile backhauling, becoming the predominant technology in use. 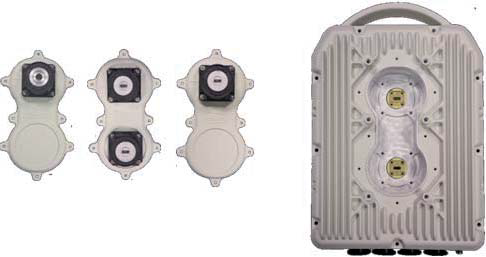 With the evolution of mobile technology, microwave radio has evolved to fit those requirements, always offering new and innovative way to enable fast RAN deployments. ALFOplus2 is the next generation 2/4 Gbps full outdoor solution to enable successful launch of LTE, by providing best TCO while boosting capacity and availability of the network. 1 x ALFOPlus2 11GHz Radio Link (choose Sub-band from Options above). 1 x ALFOPlus2 Microwave Radio Terminal Sub-band 1. 2 x XPIC configuration for Direct Antenna Mounting. 8 x RJ45 waterproof IP67 Connector. 2 x ODU Grounding Kit. 2 x HD Pointing Cables. 2 x HD Console Cables. 2 x Power Supply Connector. OMT Branching: Integrated circular dual pole antenna that combines both ODU ports to V/H cirular interface. Hybrid Branching: Integrated antenna that combines both ODU ports to Single pole interface. Dual Waveguide Branching(Pass-through): it exposes both antenna ports (Antenna Flanges are rectangular). OMT Dual Waveguide HYBRID Main body bay lodges one out of the 3 Options. Full frequency 6 GHz to 38 GHz coverage to address any application, offering very high modulation schemes to reach 4 Gbps capacity transport in a single compact unit. SM-OS Single Operating system common to all the SIAE MICROELETTRONICA's product platform. The SM-OS accelerates the distribution of new carrier grade features throughout the network. It guarantees common consistent behavior and operational capacity for the entire portfolio. It brings flexibility where it is needed. Unmatched spectrum efficiency and larger channel selection (single 10 MHz up to 2x80 MHz channels). Integrated XPIC capability using 34% less power consumption than dual single carrier solution. Future proof architecture that quadruples the throughput, achieves better link availability and reduces the antenna size. Best in class system gain for Microwave Backhaul in all the frequency bands. Drastic reduction in TCO thanks to high level of integration and Zero foot print. full IP radio, providing the foundation for a leading edge network. fully integrable with 3G, 4G, LTE nodes and backhaul. ideal for a fast and flexible evolution towards full IP network. complementary solutions for fiber deploy. last mile fiber extension for business customers. ISP high capacity and performance, for LAN-to-LAN connections. ALFOplus2 doesn’t need any indoor unit and the power supply can be provided directly by POE through the data cable or through a dedicated auxiliary port. 2xGbE Electrical ports (1Gbps line rate): LAN3 and LAN4 (with PoE). 2xGbE Optical interfaces (1Gbps or 2.5Gbps line rate): LAN1 and LAN2.